Home » Jimmy’s Iced Coffee presents Channel Coast Log Jam 2017 – The Results! Jimmy’s Iced Coffee presents Channel Coast Log Jam 2017 – The Results! The Channel Coast Log Jam has just completed its 8th event on the shores of Bournemouth, this past Sunday 23rd September. The Log Jam is a celebration of traditional surfing, nine foot plus single fins and the community of loggers based on the Channel Coast. Established in October 2013, it has quickly become an anticipated event in the south coast’s logging calendar and has garnered support from leading brands and participants including James Parry & Ben Haworth and local stand outs Ben Brown & Mike Winter whom all have their names on the Trophy. On the morning of Sunday 23rd a booming swell moved into the waters of the South West UK and started to light up breaks far and wide. On the last day of the waiting period, channel coast locals woke to flat & choppy seas, and with blind faith headed to the beach, knowing a swell was traveling and on its way… fingers crossed; by 11am it arrived on cue, waist high peelers and sunshine. 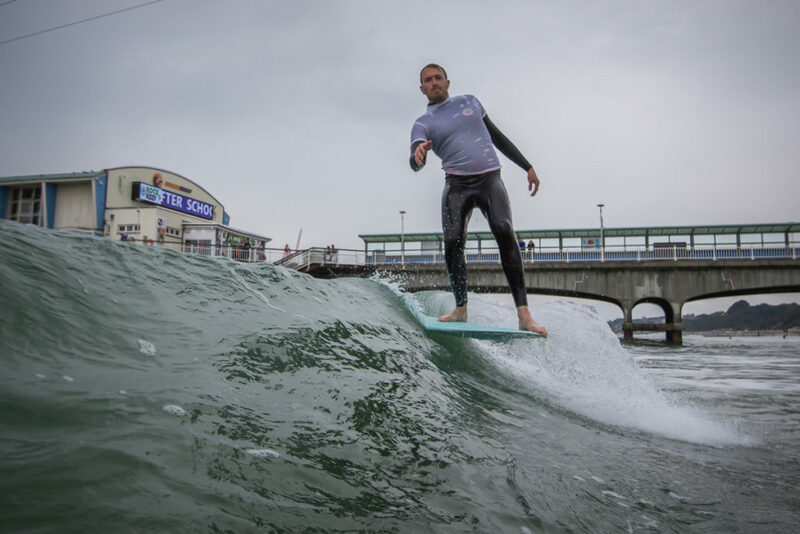 “We staked out a peak on the east side of Bournemouth Pier, and enjoyed lefts and rights to ourselves. Good crew, boards, single fins and an 8th log jam got under way.” Said log jam event organiser Andy White. 16 loggers from seasoned vets to first timers entered to make the 4 first round heats, 2 semi’s and a final. Water photographer Jake Moore and music photog Chris Lopez Photographer documented the goings on, both well respected lense men. Loggers surfing for a place in the final and also individual awards that can be won at any point of the event with prizes and support from Sea Folk – The Salty Merchants – Chariots of the Sun – Passenger clothing – Conker Spirit – Business & Brollies and of course headline sponsor Jimmy’s Iced Coffee. Ben Brown took the well deserved log jam win, for the 2nd time, with fluid, technical and stylish surfing.. an underground logger that would be appreciated globally and could fit into any scene around the world. Michael Winter came a close second with the most solid nose riding of the event on a self shaped Acre Surfboard. Oli Penwarden came in third with a couple of wild waves per heat to progress him all the way to the final on borrowed boards.